Satyavrada Kshetram, Attiyoor, Kancheepuram, Satya-Vrata-Kshetram. Ananthasaras, Sesha, varaha, Brahma, Padma, Agnikusala Theerthams, Vegavati River. Brigu, Narada, Aadi Sesha, Brahma, Gajendra. Boodathazhwar(2), Peyazhwar(1), Tiurmangai Azhwar(4). Total – 7 Pasurams. Avathara Sthalam of Poigai Azhwar & Swami Desika. 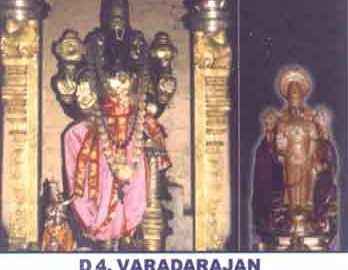 The idol of Lord Atthi Varadha made of fig (atthi) wood is kept inside the pushkarini and is brought out only once in 40 years and kept for darshan for ten days. The Garuda seva is very famous. As per sthala purana, Brahma conducted yagna here(Ka-Brahma, Anjitha worship) and hence called Kancheepuram. Pleased with the yagna, the Lord granted a boon, hence the name Varadaraja. Kancheepuram is considered very holy by Vaishnavaites as this place helped in propagation of Sri Vaishnavism. About a km from from the Chengulpet – Arokkanam Route and about 90 km from Madras by road.